Looks good, works well, cooks beautifully, easy to clean. The mains cord is quite short. The microwave's construction is good, and overall Whirlpool FT339 silver microwave is very well designed - in fact the only minor quibble we have is that the mains cord is a little on the short side. The buttons are well labelled, and easy to operate - overall our testers had no issues when using the Whirlpool FT339. leaning the microwave was relatively simple; the interior wiped clean easily, which makes this microwave practical, and should help keep it's new looks. Overall weight of this microwave is around 24kg, and the exterior dimensions are 47.2cm by 54.8cm by 33.3cm. A 32.5cm turntable is included, which should accommodate most dishes. There are 8 different power levels, with a maximum of 950w power output when using the regular microwave mode. 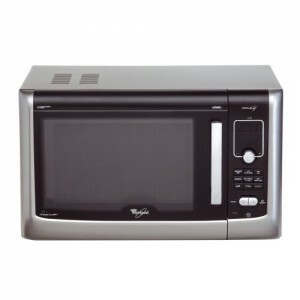 Overall our testers really liked this microwave - it works well, and looks really good. It feels solid, and should provide years of usage. It does have a relatively large price tag, but we believe it offers very good value for money. Overall we're very impressed with the Whirlpool FT339 - it cooks really well, is easy to use and clean, and offers good value. This microwave is also available in black.